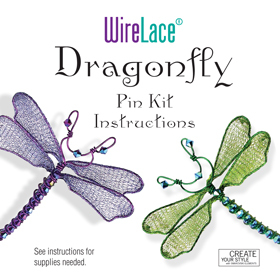 Create a luminous dragonfly pin to adorn you clothing, hat, hang in your window, use as an ornament or even make an eye-catching mobile with several! PDF NSTRUCTIONS include detailed step-by-step illustrations with wing template grid. 1 pin (3/4" long by 1/8") If longer simply wrap wire more times around pin . OPTIONAL BUT VERY HELPFUL: Wire smoothers, Tool Magic is used to create a rubber coating to avoid gouging the wire and can be peeled off when done. the PDF instruction file will be emailed to you.